A checklist of guidelines and cautions. For playgrounds to be safe places for children, there must be oversight on the use and maintenance of their equipment. It is far too easy to take the safety of playground equipment for granted. When we do that, harm can come to children, who can't assess for themselves whether their play zones are safely designed and maintained. The following checklist is a helpful guide to anyone responsible for playground equipment, including parents, who may be the only adults present when children arrive to play. Adults should check equipment and grounds. Playground equipment can develop frayed plastic or metal that can snag clothes or cause injury. Similarly, any ground connection parts should be adequately protected or covered to prevent exposed concrete or bolts from protruding. On hot days, adults should check on exposed surfaces to ensure over- heated plastic or metal does not harm anyone. Kids should fit the equipment on which they're playing. Age-appropriate equipment is important for safety. Children who are too small to reach critical rungs or crossbars are susceptible to falls. 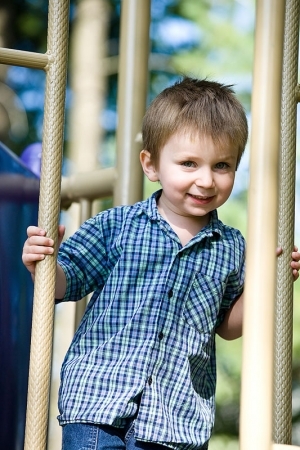 Kids who are too big for play equipment can hit their heads or even intimidate smaller children. Look for loose equipment and bolts, as well as stray ropes. Even the best playground equipment when left to the elements or subject to constant play without maintenance checks can develop dangerously loose bolts, broken chains, and worn elements. Strings and ropes that fray may have been tied onto equipment by creative or bored kids. All these circumstances can present safety hazards and should be reported or fixed immediately. Direct children to remove sports gear, bike helmets, or jewelry on the play- ground. Playgrounds are full of nooks and crannies that can snag sports equipment, resulting in strained joints or muscles, or even strangulation if a bike helmet is caught. Proper shoes are important, too, as flip-flops and other loose footwear can come off during play, causing a fall. Children should also re- move jewelry or even loose clothing that can catch on equipment. Pick up after dogs, geese, and birds. A healthy play environment does not contain animal feces. Find a plastic bag, remove dog or goose poop, and (with gloves) wipe off bird droppings from equipment. Check the heat, cold, and moisture conditions on equipment. Children may rush to jump on a playground even when the sun is so hot the equipment can burn skin. The same thing goes for playing on very cold or freezing playground equipment. Adults should always consider environmental conditions. If it has recently rained or snowed, footing can be slippery. Check the ground surface for consistency. Be sure to check the areas below playground equipment where children may fall. Is the depth consistent and deep enough (12 inches) to protect children who do fall? Are there bumps or hard protrusions that could harm or trip a child? In urban areas where rubber surfaces may be used, check the ground for safe temperatures, glass, or other dangerous materials. Taking responsibility for the safety of the playgrounds on which children play is a choice that prevents harm and even saves lives. The steps are often simple, but the safety you provide is worth every second you devote to the task.